Thornaby resident Heather Osbourne has quit smoking after more than 40 years and is now feeling healthier than ever. Heather Osbourne, 55, who is originally from Scotland and has lived in Thornaby for 35 years had been smoking for 43 years, but a health scare last year made her think twice about the habit. She said: “I became quite poorly last year. I’d lost around five stone and I suffered a stroke. It was at that point I realised I needed to do something about it. “I want to be here for my family, I want to see my five grandchildren grow up and get married. Being poorly made me realise I needed to do something to improve my health. I made the decision last December to quit smoking and first visited a local pharmacy in Stockton. “I started the new year by going along to my local stop smoking group at the High Flyers Children’s Centre in Thornaby. The support has been great. I would recommend the service to anyone who really wants to quit smoking. 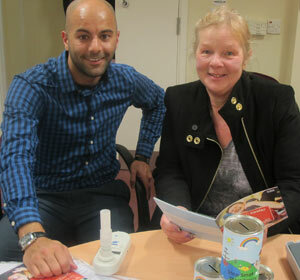 Specialist stop smoking advisor Rafeed Rashid said: “Quitting smoking isn’t easy and that’s why we’re here to help. People who receive help and support from us are much more likely to successfully quit and are up to four times more likely to stay smoke free. It is never too late to give up. “People have to be in the right frame of mind when they quit smoking. Sometimes people need to give it a couple of goes, but it was clear that Heather was determined to quit right from the start. After seeing an advisor and setting a quit date, clients have a one-to-one consultation with the advisor at their convenience to support their progress and to help them keep on track. To find out how you can get help stopping smoking visit www.nth.nhs.uk/services/stop-smoking-service/ or call 01642 383819.